Hi, Moms! Loving your baby, loving your body, and staying healthy are three happy goals that will keep you going for a lifetime. 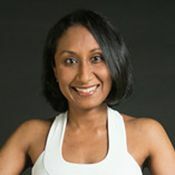 Join Kirti in a tummy-tone postpartum yoga practice to work your transversus abdominis and rectus abdominis muscles, as well as the pelvic floor. Lots of encouragement in this practice to help you love and accept your amazing body!